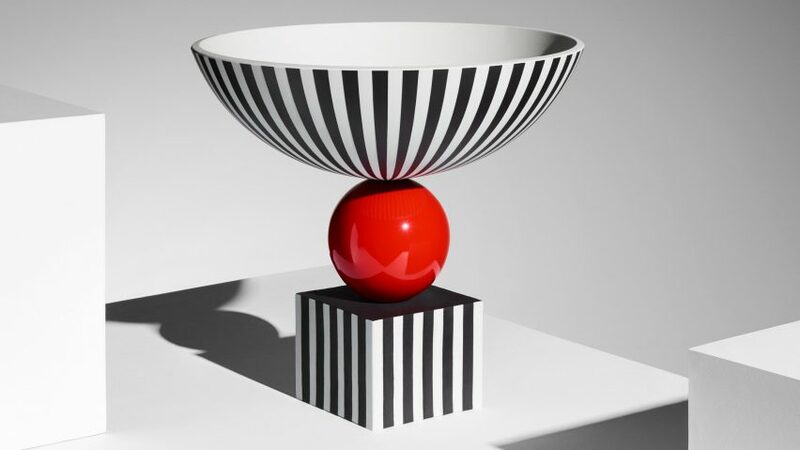 Lee Broom has created a collection of ceramics for British luxury brand Wedgwood, which feature monochrome stripes and colourful detailing reminiscent of postmodernist design. Broom, a British designer, has partnered with the iconic brand to create a capsule collection of Jasperware – a type of pottery first developed by Wedgwood in the 1770s. The range of bowls and vases will begin at £7,000, and will be sold exclusively at London department store Harrods in editions of 15 per piece. When designing his first collection with Wedgwood, Broom looked back on some of the brand's most iconic pieces, particularly the Panther Vase, which Wedgwood describes as having a "sense of modernity". First introduced in the late 18th century, the Panther Vase was named after its handles, which took the form of panther heads. "Attracted initially to the timeless black and white stripes of the Panther Vase for its sense of modernity, Broom used this as a starting point for the collection," said Wedgwood. The designer combined this graphic stripe with elements borrowed from postmodernism, such as vibrant colours and glossy finishes. Broom, who has been working on the collection for the past three years, described the collaboration as a "fascinating process" that allowed him to "reimagine the brand's iconic designs". "I hope they will become the collector's items of the future," he said. Broom set up his own design label in 2007. As well as numerous collections of furniture and lighting, he has also completed a variety of retail, hospitality and residential interiors, including a personal shopping suite for Topman and a prostitution-themed restaurant.